Reading and share top 816 famous quotes and sayings about Publish by famous authors and people. 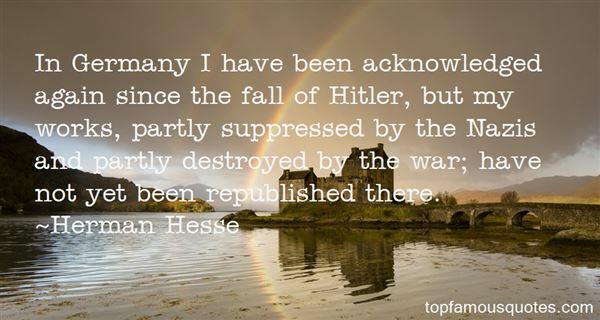 Browse top 816 famous quotes and sayings about Publish by most favorite authors. 1. "It began to falter not when the book publishers who loved books gave way to those who preferred profits to reading. It happened when publishers and editors cut back on their drinking. If there is one national flower in book publishing, it is the martini." 2. "I am very conscious that, from the time of 'The God of Small Things' was published 10 years ago, we are in a different world... which needs to be written about differently, and I really very much want to do that." 3. "Once I decided to write, to be published, I knew it would happen." 4. "Mrs Loudon was even more successful than her husband thanks to a single work, Practical Instructions in Gardening for Ladies, published in 1841, which proved to be magnificently timely. It was the first book of any type ever to encourage women of elevated classes to get their hands dirty and even to take on a faint glow of perspiration. This was novel almost to the point of eroticism. Gardening for Ladies bravely insisted that women could manage gardening independent of male supervision if they simply observed a few sensible precautions – working steadily but not too vigorously, using only light tools, never standing on damp ground because of the unhealthful emanations that would rise up through their skirts." 5. 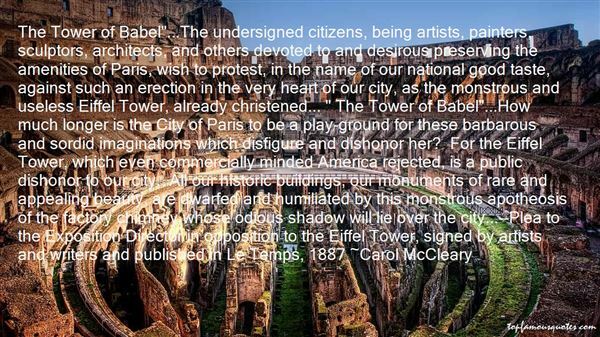 "The Tower of Babel"...The undersigned citizens, being artists, painters, sculptors, architects, and others devoted to and desirous preserving the amenities of Paris, wish to protest, in the name of our national good taste, against such an erection in the very heart of our city, as the monstrous and useless Eiffel Tower, already christened... " The Tower of Babel"...How much longer is the City of Paris to be a play-ground for these barbarous and sordid imaginations which disfigure and dishonor her? For the Eiffel Tower, which even commercially minded America rejected, is a public dishonor to our city. All our historic buildings, our monuments of rare and appealing beauty, are dwarfed and humiliated by this monstrous apotheosis of the factory chimney whose odious shadow will lie over the city...--Plea to the Exposition Director in opposition to the Eiffel Tower, signed by artists and writers and published in Le Temps, 1887"
6. "The standard heroes and heroines of novels, are personages in whom I could never, from childhood upwards, take an interest, believe to be natural, or wish to imitate: were I obliged to copy these characters, I would simply -- not write at all. Were I obliged to copy any former novelist, even the greatest, even Scott, in anything , I would not write -- Unless I have something of my own to say, and a way of my own to say it in, I have no business to publish; unless I can look beyond the greatest Masters, and study Nature herself, I have no right to paint; unless I can have the courage to use the language of Truth in preference to the jargon of Conventionality, I ought to be silent." 7. "What I don't get about "traditional publishing" is that an author creates a work that they think is good enough to be published. They then have to spend their valuable time begging others to exploit them to point where they end up with a 5% stake in THEIR business. What kind of a screwed of business model is that?" 8. "But if I worried too much about publishers' expectations, I'd probably paralyze myself and not be able to write anything." 9. "I wanted to highlight that whole dreadful process in book publishing that 'nothing succeeds like success.'" 10. "My family always comes first. My world revolves around my husband, Peter, our daughter, Victoria, and our son, William, but not necessarily in that order. Then, it's this fascinating world of publishing that devours most of my days and many nights." 11. "[...]he also had a device which looked rather like a largish electronic calculator. This had about a hundred tiny flat press buttons and a screen about four inches square on which any one of a million "pages" could be summoned at a moment's notice. It looked insanely complicated, and this was one of the reasons why the snug plastic cover it fitted into had the words Don't Panic printed on it in large friendly letters. The other reason was that this device was in fact that most remarkable of all books ever to come out of the great publishing corporations of Ursa Minor - The Hitch Hiker's Guide to the Galaxy. The reason why it was published in the form of a micro sub meson electronic component is that if it were printed in normal book form, an interstellar hitch hiker would require several inconveniently large buildings to carry it around in." 12. "My publishers are wonderful because they have let me write what I wanted to. They're wise enough to know that, with any author who's not simply writing formulas - who's trying to create something new - pressuring them to do something for market purposes almost always backfires. I can't imagine working under those circumstances, actually." 13. "The advantage of taking pictures of the famous is that they get published." 14. "Have a lived life instead of a career. Put yourself in the safekeeping of good taste. Lived freedom will compensate you for a few losses. . . . If you don't like the style of others, cultivate your own. Get to know the tricks of reproduction, be a self-publisher even in conversation, and then the joy of working can fill your days." 15. "If I couldn't get published tomorrow I'd still be writing. It's something to do with feeling so overwhelmed by this experience of life that you have to tell someone about it, and in a way that reorders the experience to make it manageable." 16. "In Germany I have been acknowledged again since the fall of Hitler, but my works, partly suppressed by the Nazis and partly destroyed by the war; have not yet been republished there." 17. "Readers will recall that the little evidence collected seemed to point to the strange and confusing figure of an unidentified Air Force pilot whose body was washed ashore on a beach near Dieppe three months later. Other traces of his ‘mortal remains' were found in a number of unexpected places: in a footnote to a paper on some unusual aspects of schizophrenia published thirty years earlier in a since defunct psychiatric journal; in the pilot for an unpurchased TV thriller, ‘Lieutenant 70'; and on the record labels of a pop singer known as The Him — to instance only a few. Whether in fact this man was a returning astronaut suffering from amnesia, the figment of an ill-organized advertising campaign, or, as some have suggested, the second coming of Christ, is anyone's guess." 18. "Pluto will always be a planet in my book. That's because my book was published before Pluto was blacklisted by planetary scientists." 19. "Democrats were simply hoping to win some political points by getting their outlandish rhetoric published in the newspapers and heard on the talk shows." 20. "The HoLee model was the first term structure model. I remember reading their paper soon after it was published and as it was fairly different from many of the other papers that I had read, I had to read it quite a few times. I realized that it was a really important paper." 21. "I am always making sketches of how information should look or mapping out a marketing campaign. When I present my notes, people start responding to them. Desktop publishing makes everything look slick. When you present sketches, it helps start the dialogue and collaboration." 22. "Music is everybody's possession. It's only publishers who think that people own it." 23. "On one occasion in 1987 the security police came looking for me because of a drawing that I'd published." 24. "I hope you will be ready to own publicly, whenever you shall be called to it, that by your great and frequent urgency you prevailed on me to publish a very loose and uncorrect account of my travels, with directions to hire some young gentleman of either university to put them in order, and correct the style, as my cousin Dampier did, by my advice, in his book called "A Voyage round the world."" 25. "If you publish a scientific paper it is very hard to start a nationwide debate about something. If you do this in a movie, you can start a debate. We like to create a bridge between those two worlds - film and science." 26. "THE MANY FACES OF SURVIVALSunday, August 10th at 2:00 PSTDachau Liberator, medical whistle-blower, award winning writer, college professor and world renowned garlic farmer, Chester Aaron, talks about the hard choices he's had to make, why he made them, and how it's changed his life. Mr. Aaron was recognized by the National Endowment for the Arts, and received the Huntington Hartford Foundation fellowship which was chaired by Aldous Huxley and Tomas Mann. He also inspired Ralph Nader to expose the over-radiation of blacks in American hospitals. Now Mr. Aaron is a world-renowned garlic farmer who spends his days writing about the liberation of Dachau. He is 86 years old and he has a thousand stories to tell. Although he has published over 17 books, he is still writing more and looks forward to publishing again soon." 27. "We all have chapters we would prefer unpublished." 28. 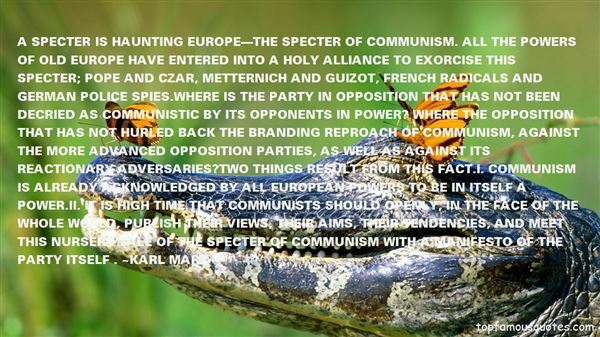 "A specter is haunting Europe—the specter of Communism. All the powers of old Europe have entered into a holy alliance to exorcise this specter; Pope and Czar, Metternich and Guizot, French radicals and German police spies.Where is the party in opposition that has not been decried as Communistic by its opponents in power? Where the opposition that has not hurled back the branding reproach of Communism, against the more advanced opposition parties, as well as against its reactionary adversaries?Two things result from this fact.I. Communism is already acknowledged by all European powers to be in itself a power.II. It is high time that Communists should openly, in the face of the whole world, publish their views, their aims, their tendencies, and meet this nursery tale of the Specter of Communism with a Manifesto of the party itself ." 29. "I think now I'm up to something like 85 different titles that I've published." 30. "The publishing industry, unsurprisingly, is full of different people who love different things and express that love in different languages. Find the people, the editors and agents, with whom you share some language, and some sense of what makes literature worth reading." 31. "It was actually an Israeli cartoonist, Nurit Karlin, who made me think that I could draw for 'The New Yorker.' I saw her work published in the magazine in the early 1970s - she was the only woman working as a cartoonist at 'The New Yorker' at the time." 32. "After seven years of writing - and working many jobs to support my family - I finally got published." 33. "Although erotica authors are being targeted, this is an issue that should concern all indie authors. It affects indies disproportionately because indies are the ones pushing the boundaries of fiction. Indies are the ones out there publishing without the (fading) protective patina of a "traditional publisher" to lend them legitimacy. We indies only have each other." 34. "I don't think anyone will believe me, but I've never been pressured by a publisher to churn out a book." 35. "As a successful romantic novelist - one of my publishers is Mills & Boon - I create the sort of male heroes that no woman could fail to adore and few real men could hope to emulate." 36. "I was just delighted to be a legitimate, for-real published author." 37. "After an author has been dead for some time, it becomes increasingly difficult for his publishers to get a new book out of him each year." 38. "Do you realize what would happen if Moses were alive today? He'd go up to Mount Sinai, come back with the Ten Commandments, and spend the next eight years trying to get published." 39. "'XIII' is a spy show. I think the comic book is a little too similar to 'The Bourne Identity.' I tried to take it away from that. I believe there was, many years ago, before the Bourne movies, a lawsuit that made it so they couldn't be published in English." 40. "Recently , crowds of thousands gathered throughout the Muslim world - burning European embassies, issuing threats, taking hostages, even killing people - in protest over twelve cartoons depicting the Prophet Muhammad that were first published in a Danish newspaper. When was the last atheist riot?" 41. "A study published by researchers at Massachusetts General Hospital in 2011 found that subjects who practiced meditation for an average of just twenty-seven minutes a day over a period of eight weeks produced visible changes in brain structure. Meditation led to decreased density of the amygdala, a physical change that was correlated with subjects' self-reported stress levels—as their amygdalae got less dense, the subjects felt less stressed. Other studies have found that Buddhist monks who are especially good at meditating show much greater activity in their frontal cortices, and much less in their amygdalae, than normal people.n Meditation and deep-breathing exercises work for similar reasons as psychiatric medications do, exerting their effects not just on some abstract concept of mind but concretely on our bodies, on the somatic correlates of our feelings." 42. "1. Why is it foolish to launch a new business with millions of dollars in TV ads?2. Are the market leaders in every industry more vulnerable to sudden successes by the competition than ever before?3. Should book publishers issue the paperback edition of a book before the hardcover?4. What's the single most important asset a company can create—and what is the simple thing that can kill it?5. Every ad needs to do one of two things to succeed...yet most ads do neither. What's the right strategy?6. Does the Net create a dynamic that fundamentally changes the way everything is marketed?7. How can every business...big and small...use ideavirus marketing to succeed?" 43. "All rights reserved. Published in the United States by Alfred A. Knopf, a division"
44. "Behind every novel is a greater story of how it came to be published." 45. "I am not scared of anyone. I will write and publish my books." 46. "So many signs exist today that you could write a book about them. In fact, I did, The Beginning of the End, first published in 1972 and then again in 1991." 47. "A ruling government can't afford to publish history in a version which lessens its' chance for reelection." 48. "So many (too many) books are published every year, and it seems everyone is writing a book. Perhaps we should all be reading more and writing less!" 49. "Audio of interview - http://www.youtube.com/watch?feature=..."No I haven't been in a ceremony but I've seen the marks on them, I've seen the terror they're in and I've seen how they were before such events happened and how they are when they speak about it, how consistent they are in other things they say, so that there has been no reason from a psychological point of view to doubt their capacity to give good evidence, but its the police who need to find the proper corroboration. "- Dr Valerie Sinason, Clinic for Dissociative Studies, London - talks about Private Eye magazine's suggestion that she "invented" the story published in the Express and that no abuse existed"
50. "For one thing, a first edition certainly is the edition nearest the heart of an author, the edition upon which his hopes were laid and his ambitions builded; and particularly is this true when the book in question happens to be an author's first publication. Imagine with what flatterings of the authorical heart, with what ecstatic apprehension, he handled his own copy of the book that day it came to him from the publisher! Is not something of this spirit communicated to the collector who loves his writer and his work? Or does that explanation partake too much of sorcery? Here is the original creation, just as it came first from the presses, with all ist strangenesses and wonder for ist orignal readers, with all ist uncorrected errors and inaccuracies to mark it as the curiosity it is. And, of course, with all those mystic values that accrue and attach to the thing that is rare and hard to find. That is all very sentimental, but it is also very practical, as will appear in due course." O God, who is ever at work and ever at rest. May I be ever at work and ever at rest."